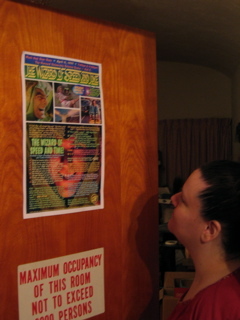 Mike Jittlov in front of his movie poster, as the Crazy Viking! (And yes, he knows they didn't wear horns, but this is Hollywood, and he's got another film planned). 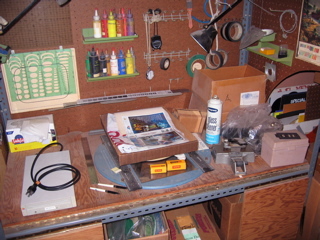 The homemade animation stand seen in the movie, which he actually used to film some of the animation in the movie, and 2 Disney TV specials. 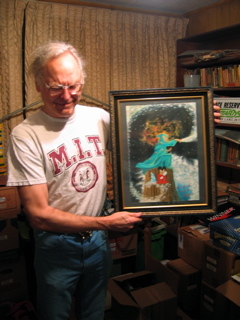 Mike with a painting sent to him by Spanish animation genius Miguel Fuertes. Jittlov tried to alert Disney Studios to Miguel's talent, but Disney passed, so Miguel went to ILM and made them famous. 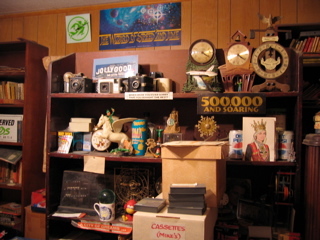 Across from the animation stand are more items used in the movie, still here, possibly waiting to be reanimated. Some of the movie scripts sent to Jittlov by their writers. 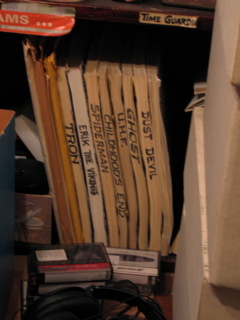 That is the original "Tron" script (written by his friend Bonnie MacBird), which Mike says is far superior to the Disney film. 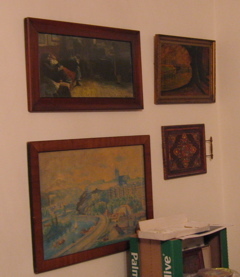 A small section of his father's language library, since this used to be Vadim Jittlov's office. Mike says his dad could speak, read, and write 85 languages and dialects. 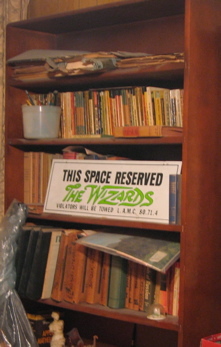 The sign is from Mike's Hollywood office. 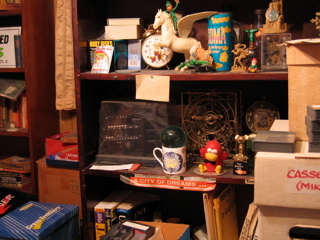 Some items from the movie. These clocks are correct twice a day. More film stuff. The card is a picture of Mike's dream-girl. And the "ET PSI" cans are mutants with only a teaspoon of Pepsi. Mike hopes to sell them on eBay and pay for the wedding. Crystal views a Wizard poster that Mike designed for his Harvard University show in 1997. 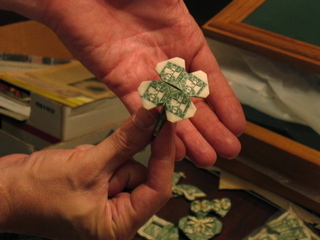 Origami with cash! Arrangements are temporary. 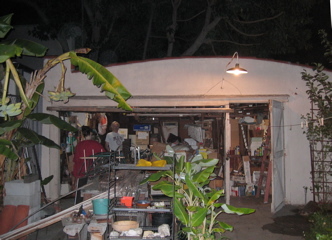 Mike has 200 more sculptures that will cover a wall with picture frames. More moneygami. The $1 heart clips inside-out and into another kind of heart. 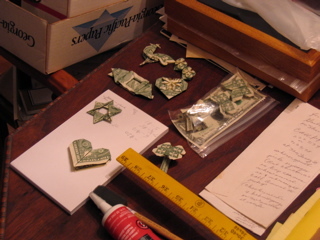 And the $1 Star of David is a legend among paperfolders. It took Mike years to find out how to make one, and still requires two hours to fold. 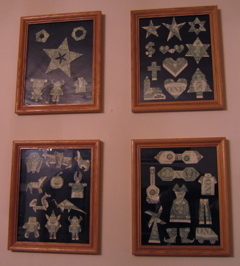 Some art works by Mike's father when he was living in Prague. Vadim Jittlov was a friend of Jan Masaryk, the Czech Foreign Minister. 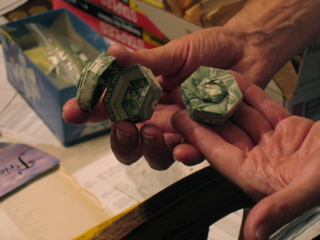 Mike holds a moneygami jewel box, precision-folded to nest three more boxes inside. 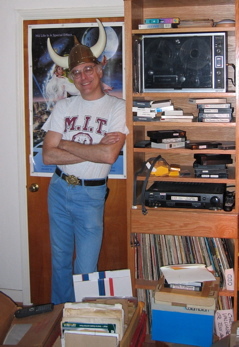 He credits the unique hobby with keeping him free of carpal tunnel, during the past fourteen years of computering. 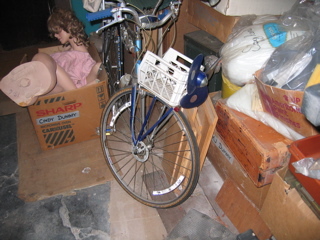 The "Cindy" dummy is not ready for her close-up. 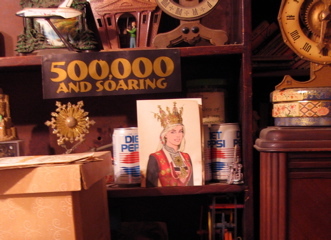 Mike is slowly cleaning and selling all of his movie props on CraigsList. Considerations when trying to figure out what stays and what goes, at what Jittlov calls "Chateau Pacque-ratt". 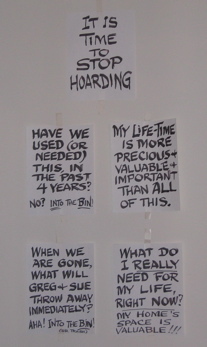 Notes on the wall are actually for Mike's mother, but could apply to many of us.